> Spanish shop>Spanish football>Atlético de Madrid F.C. Atlético de Madrid F.C. There are 10 products. The Atlético de Madrid football (soccer) club is one of the teams from Madrid, capital of Spain. It was founded on the 26th of April 1903 and is part of the first division league in Spain. The president of the club is film producer Enrique Cerezo and the honorary president named during the 2003 centennial is Felipe of Borbon and Greece, Prince of Asturias. The club plays at Vicente Calderon Stadium which has a capacity for 54,851 people. The Atletico de Madrid is the club with the third most national titles from the Liga (9 titles) following the Real Madrid and the Barcelona F.C. Club Atlético de Madrid leatherette wallet, with banknotes, coins, cards and passport compartment, it has a pendant key ring. With velcro closure. Dimensions: 5.1 x 3.5''Atlético de Madrid soccer club licensed product. 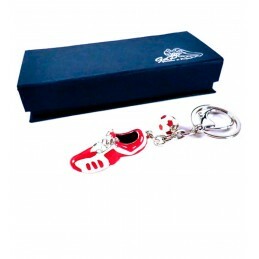 Keychain with football boot and ball of the Atletico de Madrid CF. In heavy metal with ring and hook for hanging. Aluminum bottle of Atletico Madrid C.F. With the team's centenary shield on the front. Screw cap and lid in plastic, measures 18 cm in height and has a diameter of 6.5 cm. Product licensed by Atletico Madrid.